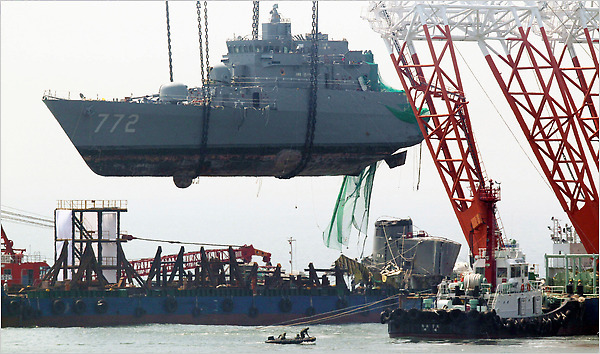 Salvaging the South Korean corvette “Cheonan” is old news now that the US has a major ecological disaster to contend with (the Deepwater Horizon oil spill), but these AP photos of the bow section of the Cheonan being raised are pretty amazing. 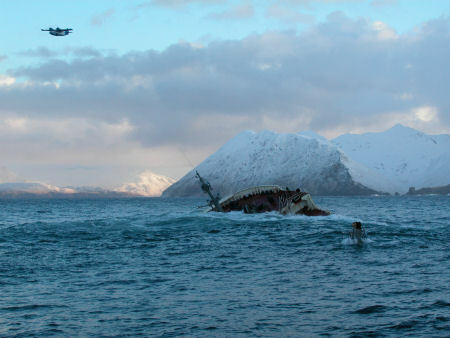 It’s hard to believe a world that has the technology to grab a sunken battleship off the seafloor after a few short days can’t plug an itty bitty mile-deep runaway oil well any faster. 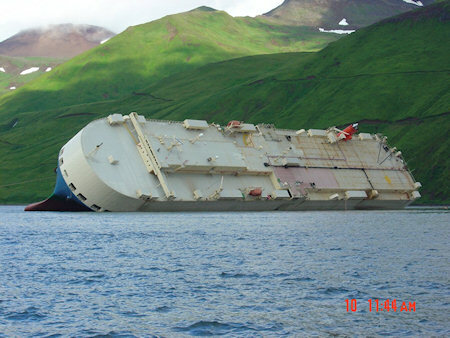 The Cougar Ace is well-known for setting a Canadian record for most vehicles unloaded from a single ship, and also for a shipping disaster that once again caught my attention primarily because of the amazing Coast Guard photos. 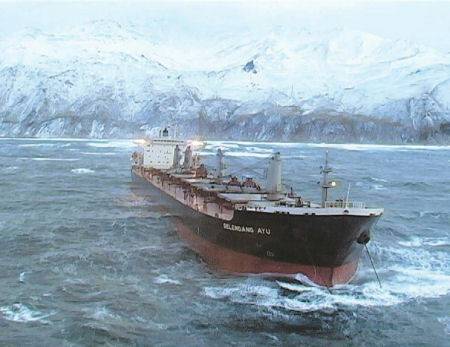 Like the Selendang Ayu disaster, the Cougar Ace became disabled off the Aleutian Islands, Alaska — this time though, the problem was an 60 degree list due to a ballast handling mistake. Wired has a pretty amazing writeup about the salvage operation. Click photos for the full-size versions. 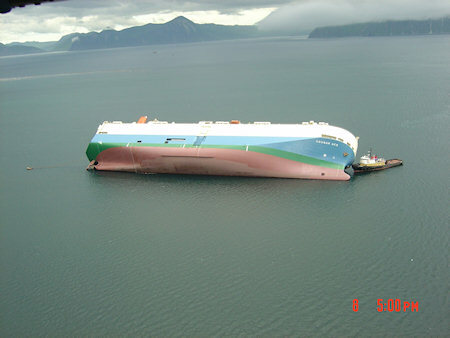 The Selendang Ayu disaster caught my attention as the wreck happened almost two years ago. 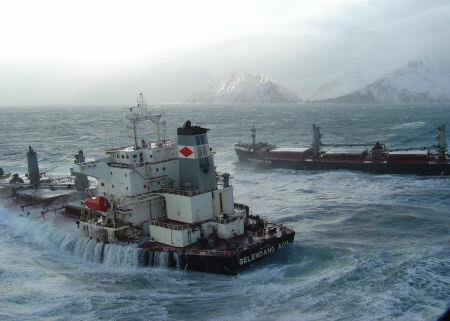 The Coast Guard photos are phenomenal, with the developing tragedy pictured against the Alaskan winter. Click the photos below to see them full-size. 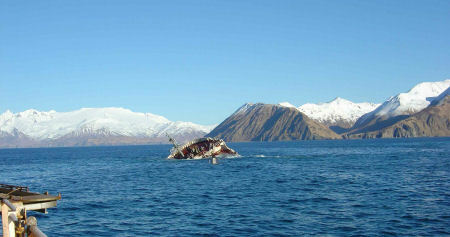 Feb. 1, 2005: last view of the bow section. 8 days later, it completely submerges. 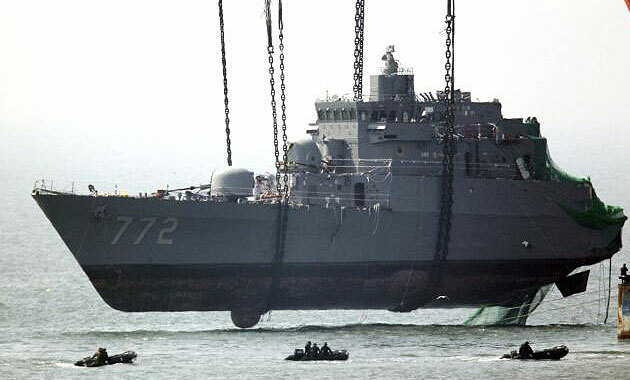 The stern section remained grounded & visible above water until October 24, 2005. “For nearly two weeks the Malaysian-flagged freighter Selendang Ayu had been struggling through deteriorating weather to carry a load of soybeans from Seattle to Xiamen, China. 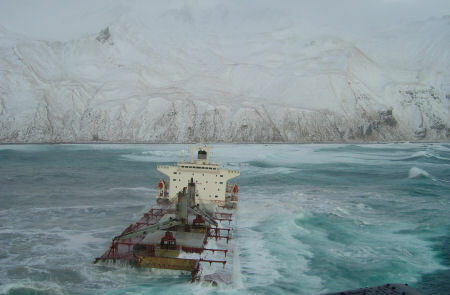 Day in and day out, the crew of 26 rode the seven-year-old, 738-ft. ship like a roller coaster, lurching through gale-force winds, snow and 15-ft. seas.